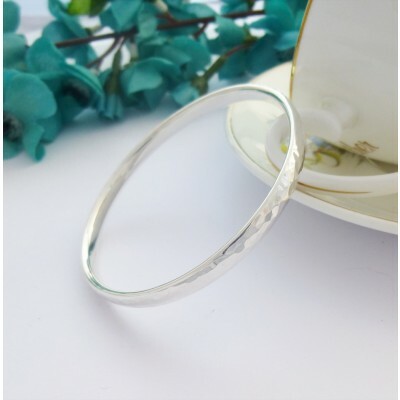 The Small Edie Hammered Bangle is a very beautiful highly polished, hammered bangle that has been handmade in the UK and is suitable for ladies with smaller sized hands/wrists. The Edie is the perfect bangle for a brithday or Christmas present and it looks gorgeous on. 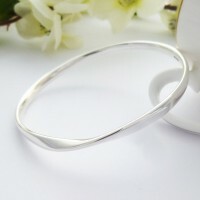 This beautiful small size ladies bangle has been hand made in the UK with a UK 925 sterling silver hallmark and is solid. The Edie small bangle is perfect for ladies who love quality sterling silver jewellery. This bangle is a solid, medium weight, oval cross section bangle with a smooth inside surface and a beautifully hammered exterior. The Edie is a round bangle that is approximately 6mm wide and 3mm deep with a 60mm internal diameter. This size is suitable for the majority of women with small size wrists. 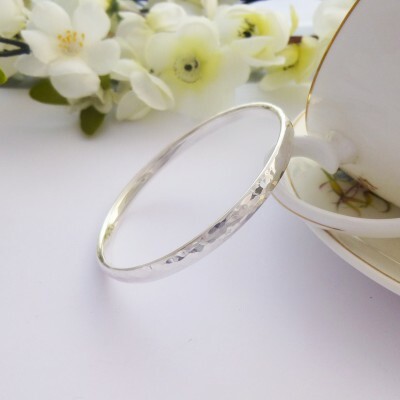 The Edie is exclusive to Guilty, it is hand made and has a hand hammered finish and is solid 925 sterling silver and is part of our engravable silver bangles collection. The Edie has an internal diameter of 60mm and is a small sized ladies bangle. 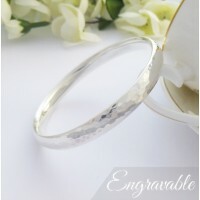 The Edie is made from oval sterling silver that is 3mm deep and 6mm wide.. 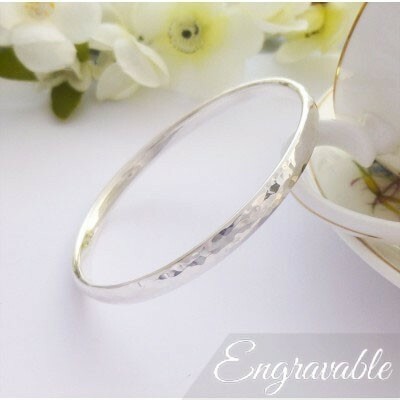 This bangle is made from solid 925 sterling silver, hand made and hallmarked in the UK.